Choose from our wide selection of hotels located in and around Cayman Islands. Whether you’re looking for budget hotels, resorts, or luxury hotels, you’ll find the best accommodations at the best prices. Stop wasting time and make your reservations online now! Boutique Luxury Resort hotel with 53 newly renovated suites, all with Ocean Views. Each suite has 640 square feet of luxurious living space, kitchenette, separate bedroom from living area and a terrace overlooking the pools and ocean. The resort offers Britannia Golf Course, a Jack Nicklaus 9, a European Beauty Spa, and Red Sail Sports. Come experience the grace and color of the Grand Cayman experience where it is all about you! The beautifully appointed Grand Cayman Marriott Beach Resort is oceanfront on spectacular Seven Mile Beach just minutes from the airport and downtown Georgetown. Our recently completed fifteen million dollar renovation has filled the resort with classic Cayman furnishings in warm hues of sea and sun, sand and sky - making it difficult to tell where the hotel ends and the island begins! 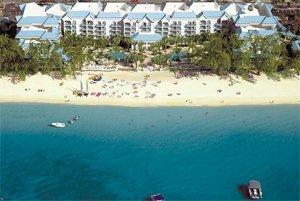 Tucked away in a beautiful tropical garden setting on Seven Mile Beach, you will find Seven Mile Beach Resort. The lush botanical gardens feature a swimming pool, lagoon with 2 waterfalls, whirlpool spa and deck with space for either sunbathing or unwinding in the shade. Spanning one hundred forty-four acres along the blue waters of the Caribbean Sea from the white sands of exclusive Seven Mile Beach to the North Sound, The Ritz-Carlton Grand Cayman sets new standards for a world-class resort both in the Caribbean and beyond. This luxury hotel features a business center, an environmentally conscious children's activities program, the first La Prairie Spa in the Caribbean, five restaurants, fully equipped fitness center, the nine hole Blue Tip golf course designed by Greg Normand and a Nick Bollettieri designed tennis center. The Westin Casuarina Resort & Spa is nestled in the warm sands of the famous Seven Mile Beach. Named to the CondÃ© Nast Traveler's 2002 Gold List, The Westin Casuarina Resort and Spa is a tropical paradise. The resort offers easy access to all of Grand Cayman's attractions, as well as a swim-up pool bar and a nearby 18-hole golf course. Explore some of the world's best scuba-diving spots with gear from the on-site dive shop or get pampered at the full-service spa.